Thomas & Betts manufacture cable and wire management products, cable conduits and other cable accessories. Within the product range is the world renowned brand of cable ties, Ty-Rap. Cable containment products are used in industries globally including oil & gas, petrochemical, food and beverage and offshore. Cable containment products are required for bundling, securing and routing cables to ensure they do not become damaged, be come a hazard and that they are performing effectively. The range of Thomas & Betts products are designed to make cable installation and bundling simple and reliable. T&D Ty-Rap cable ties are the market leading product for cable restraint. Available in different variations and sizes, Ty-Rap cable ties use the power and grip of steel to ensure the cable tie does not stretch, become loose or fail completely. This is done by using a steel locking mechanism compared to other products that traditionally use 100% plastic. The use of a steel locking barb gives a superior performance and enables the product to perform for longer. Thomas & Betts Ty-Rap cable ties have been the number one choice for professional electricians and engineers for over 50 years. The Ty-Rap cable ties have excellent performance in harsh environments and last longer than competitor cable ties. Thomas & Betts Ty-Met range are stainless steel cable ties that provide the optimal solution when securing and bundling cables in hazardous areas. Ty-Met stainless steel cable ties are constructed from non-magnetic, 316 marine grade steel and can be supplied either un-coated or with a halogen free polyester coating. The Ty-Met cable ties utilise a ball lock mechanism and are self locking meaning no compression or manual folding is required. 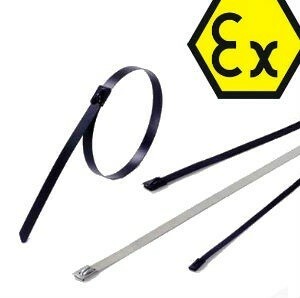 These cable ties are typically used to restrain low voltage and high voltage power, instrumentation and control cables. The locking mechanism on the Ty-Met stainless steel cable ties incorporates a high strength locking ball and has a low insertion force enabling easy installation. Due to the composition of the Ty-Met range, the products are suitable for use in hazardous areas and other harsh conditions in industries including oil and gas, offshore, marine, petrochemical, food processing and mining. T&D were established in 1985 and are now one of the largest Thomas & Betts cable and wire management product stockists and distributors – we provide expert technical support, competitive quotations and international delivery for Thomas & Betts cable Ty-Raps, cable conduits and cable accessories. Established in Memphis, TN in 1826, T&B. Today the company has over 100 years experience in manufacturing and providing electrical components for global commercial markets. A Global Leader in innovative Wire and Cable Management, Cable Protection Systems, Power Connection, Thomas & Betts employees over 13,000 people today and continues to grow. T&D International are Main UK Distributors for Thomas & Betts Electrical Products.